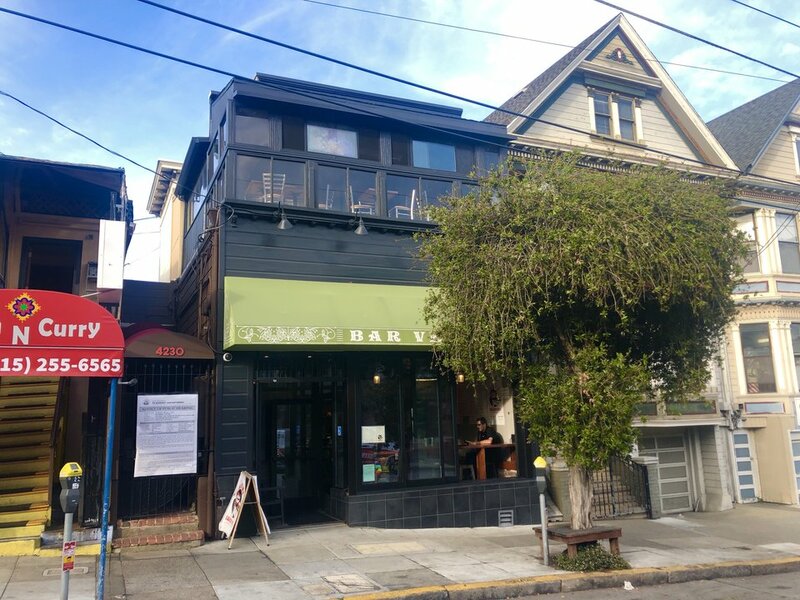 Earlier this month, the Planning Commission approved a change of use request to transform Bite Me Sandwiches (4230 18th St. between Diamond and Collingwood) into Hotel Castro, a boutique 12-room lodge. Property owner Gannon Tidwell said the request was approved at the commission's March 1st meeting. "Our next steps are to get our site permit and then move on to pursue our building permit," he said. 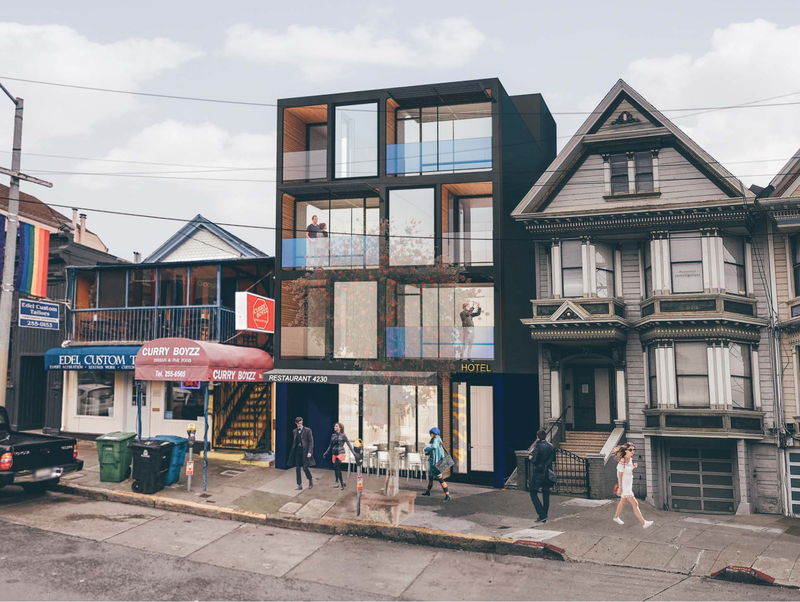 Tidwell, a real estate entrepreneur with Marin-based Postcard Properties, said he expects "it will take approximately 6 months to get our building permit and then we will start construction." Before construction begins, the building will have to be demolished, but permits have already been filed to tear down the existing 5,625-square-foot structure, built in 1900. Renderings by design firm Cass Calder Smith Architecture depict a hotel that rises 40 feet with a rooftop deck and an 1,800-square-foot restaurant on the ground floor, but no formal lobby. As proposed, the hotel lacks off-street parking and loading zones, but most guest are expected to travel via public transportation, taxis or ride-hailing services. Construction hours will also be limited to 8am-6pm daily with no work on Sundays, and contractors would create noise walls and deploy mufflers and dampeners to decrease vibration in surrounding buildings. After it opens, Hotel Castro will be staffed by managers, security and a concierge with cameras at ground level and a 24/7 hotline for guests and neighbors to address security concerns. 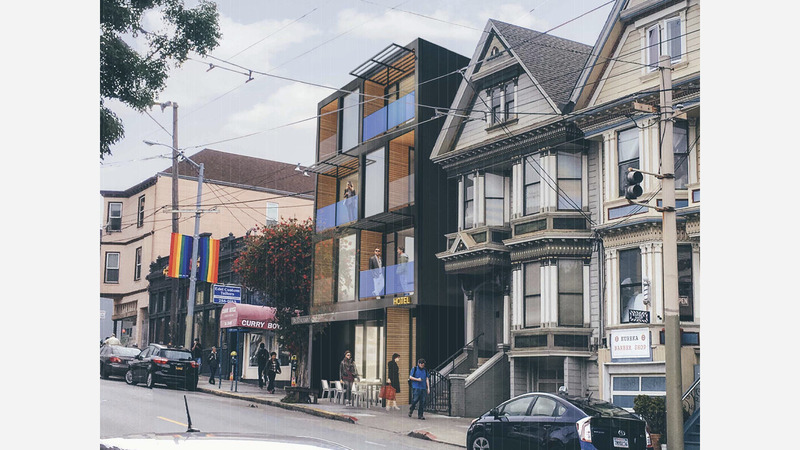 The hotel's backers perceive a lack of lodging options in the Castro, as visitors are limited to Beck's Motor Lodge and a few bed and breakfast spots like Parker House, The Willows Inn and Inn on Castro. Tidwell said he and Hotel Castro's sponsors believe the neighborhood "is a world-class travel destination" that deserves its own hotel. "We would like to fill this void with a high style boutique offering."